Whereas Country Bears (2002), The Pirates of the Caribbean (2003) and The Haunted Mansion (2003) were all based on Disney attractions, this film is named after an entire section of the park. Nice Tomorrowland alterations to the standard Cinderella’s castle Disney opener. The fanfare sequence gets a futuristic upgrade. A creative flourish that recalls the Paramount peak morphing in the Indiana Jones films. The scene where the kid tests his jet pack is reminiscent of #TheRocketeer. Skidding to a halt in the middle of a fallow field is a common denominator between both movies, but this film’s sequence is set during the day while The Rocketeer’s (1991) was filmed at night…and involved a statue rather than a real person. It’s a Small World After All. The ride within a ride. Very cool. This sequence is a lot of fun. It really taps into the excitement and mystique associated with the secret passageway fantasy trope, a la the magical coat closet in The Chronicles of Narnia: The Lion, the Witch and the Wardrobe (2005). A thumbs up from the fixit robot. Especially in postmodern times, when there seems to be a paucity of new thought. The Tale of Two Wolves. Which one will you feed? This motivational anecdote has been done to death in recent films. Since the moral of the story actually factors into this film’s climax, we’ll let it slide this once. The Tomorrowland pin is like the #OneRing. I’m glad Casey took my advice and found a wide open space with which to explore Tomorrowland. Less contusions and concussions that way. Of course, The Black Hole (1979) was produced by Disney. Trivia: TBH was the studio’s first PG rated film. Although it does have a Clockstoppers (2002) freeze-frame vibe to it. Don’t worry; his bark is way worse than his bite. Wonder if Disneyland will make a Bathtub Ride based on this movie. They have a teacup ride, right? Why not a Bathtub Ride? They’d have to design it as a water ride, though. Towel not provided. You can purchase one at the line entrance for $20. Whenever someone says it’s not personal it always is. Correction: programming. Darn Twitter didn’t underline it as being misspelled. “Well zippity doo for you.” Ha! The Eiffel Tower splits in half to become a rocket platform. Getting a bit #FarFetched. My suspension of disbelief was completely obliterated by this scene. Some might find this launch sequence to be a unique way of utilizing the famous Parisian building, but I thought it was exceedingly daft and contrived beyond belief. There are a million other places on the planet to hide a space rocket, and the majority of them would’ve made more sense. Flashes of the future. Hold on to your hat. You’d think that if she saw it coming she would put her hand on the cap to keep it firmly in place. Casey either has poor judgment or slow reaction time. “You want to sink.” Though overly doom and gloom, this is one of the better villain monologues ever. Remember when Syndrome catches himself monologuing during a climactic scene in The Incredibles (2004), an animated smash hit helmed by this movie’s director, Brad Bird? Since Bird was so openly critical of villain monologues in that earlier film, you just knew he’d take painstaking efforts to insure that Nix’ sermonizing speech was incredible…and it is. Kids walk through a stargate to recruit the citizenry of the new Tomorrowland. I want one. A pin, that is. The teens hand them out at random like Golden Tickets in Willy Wonka & the Chocolate Factory (1971). Final analysis: contains imagination and creativity but never quite achieves the state of awe it strives for. Rating: 2 1/2 out of 4. There’s plenty of movie magic here, but the pedestrian plot is a major drawback. 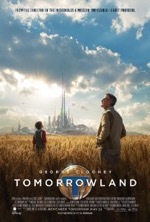 Despite its apparent surfeit of creativity, Disney’s Tomorrowland is simply a smoke-and-mirrors production that’s every bit as sleek, superficial and soulless as its titular city. Though saturated with technological wonders and mind-blowing visuals that pop out at us from every square inch of the screen, the futuristic metropolis is little more than empty artifice. It’s a cold, mechanical world where a bright future is subverted by a sinister all-seeing orb…this movie’s answer to Sauron’s baleful eye in LOTR. The trouble here is that instead of taking the time to craft a world that’s genuinely groundbreaking in conception and application, the “creative” minds at Disney Studios have merely settled for a pastiche approach, and the resultant movie suffers dearly for that decision. The first story derivation involves a flashback to George Clooney’s character as a boy. Young Frank Walker excitedly demonstrates the capabilities of his homemade jet pack at a science fair and is rejected out of hand by the movie’s antagonist, Nix (Hugh Laurie). By now, this science fair opener has been done to death in Disney films (reference Meet the Robinsons (2007) and last year’s Big Hero 6). Additionally, the jet pack was used extensively in The Rocketeer (1991). The Tomorrowland pin allows a person to walk around the futuristic city, but real world boundaries still exist, which limit the extent of a person’s movements in the alternate realm. This is an extremely clever concept (and it’s executed very adeptly in the movie), but it also hearkens back to Star Trek: The Next Generation’s holodeck. During the movie’s climactic events, characters use an energy portal to travel back and forth between present reality and the future dystopia, and it functions in a similar manner to ST:TOS’ Guardian of Forever (“The City on the Edge of Forever”) and the eponymous apparatus in the three Stargate TV series’. These are just a few examples of how the movie’s writers have borrowed liberally from other sci-fi/fantasy films. And then there’s the shameful product placement in the comic book shop, which features merchandise from Disney, Marvel and Lucasfilm (all owned by Disney), to the exclusion of the many other brands and products you’d find in a real comic shop. And then there’s the Eiffel Tower as rocket launch pad sequence which, despite earning points for its ingenuity and attempt at providing a history lesson, is utterly ridiculous…one of the dopiest plot devices/set pieces I’ve witnessed on the big screen in a great while. And then there’s the dubious decision to feature George Clooney as an action hero (his Batman days are long gone). Laurie is serviceable as the movie’s brooding antagonist, but his participation would’ve been more effective had he been cast against type—his part is painfully predictable. Casey’s (Britt Robertson from TV’s Under the Dome) enthusiasm and optimism is really what saves the day, both for the characters onscreen and the movie as a whole. Unfortunately, the bulk of her dialog and the simplistic, straightforward story (free from any emotional complexity or genuine jeopardy) render the whole proceedings as a kind of lavishly produced Disney Channel movie of the week. As such, the preteen set will probably embrace the film, while the rest of the audience will more than likely feel tepid toward the final product. So, will this film inspire a sequel? Tomorrow will tell.